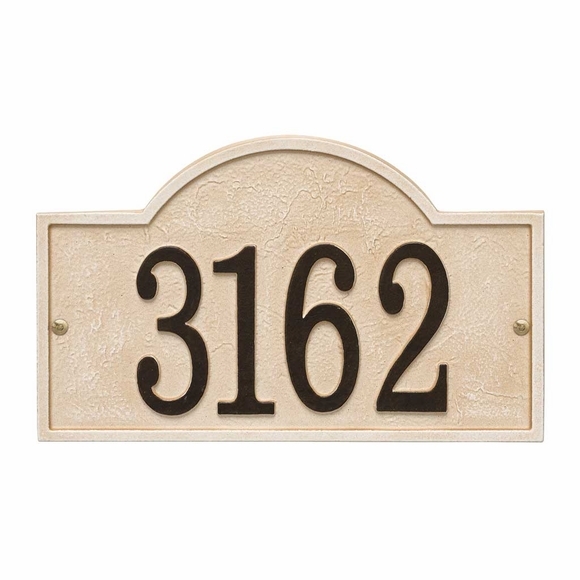 Metal Sandstone Address Number Sign - - natural stone appearance with a southwestern personality. Manufactured from high-density cast aluminum alloy. Made in USA. Wall mount plaque comes in four traditional shapes: arch, rectangle, oval, and vertical oval. Large dimensional numbers stand out prominently against the neutral sandstone background. Raised self-border repeats the sign shape. Arch, Rectangle, and Vertical signs hold up to five (5) 4" numbers. Oval sign holds up to four (4) 4" numbers. Vertical sign dimensions: 3.5"W x 19"H x .375". arch: 12"W x 7.25"H x .375"
rectangle: 11.25"W x 6.25"H x .375"
oval: 12"W x 6.75"H x .375"
Metal Sandstone Address Number Sign. Natural stone appearance. Made in USA.